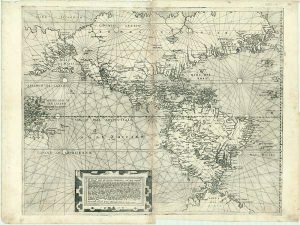 September’s Map of the Month is one of only seven surviving copies of Paolo Forlani’s 1574 map of the Americas. Beautifully engraved in a clear and legible style, this map shows the continents of North and South America as separate from Asia. Wind-rose lines surround the Americas; these would have aided navigation for sailors. 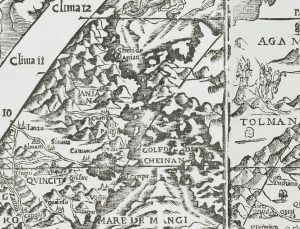 To the south lies “Terra del Fuogo” or the land of fire, which on Forlani’s map appears to be the Northern tip of another continent. This name was coined by the Magellan expedition of 1520, as a result of seeing many native fires burning in this area as they explored. The archipelago of islands lying to the South of the Strait of Magellan retain the name Tierra del Fuego to this day. 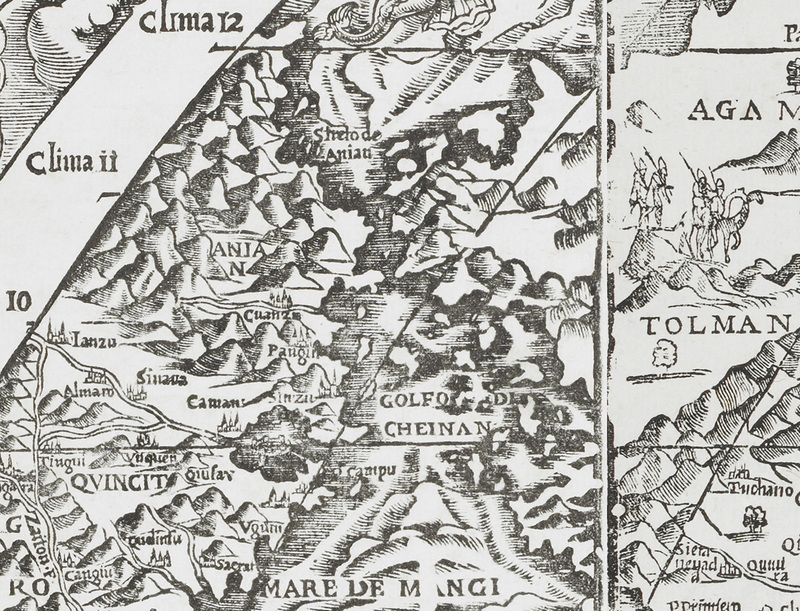 Forlani’s map was printed in Venice, at that time the leading centre for the production of new map prints. Venetian cartographers often drew heavily on existing maps when preparing new prints, although they might also add new information received from merchants, explorers and other sources. There were several different stages to the creation of a map, and these might be carried out by more than one individual. These included: collating information from existing maps and other sources; drawing the map to be engraved; engraving the copper plate; printing copies and selling the map prints. Paolo Forlani appears to have specialised as a map engraver, and many of his maps are clearly based on existing mapping. On this 1574 map of the Americas, Forlani claims that information for the map came from Don Diego Hermano de Toledo, a gentleman of noble quality, who gave him a drawing of the New World. 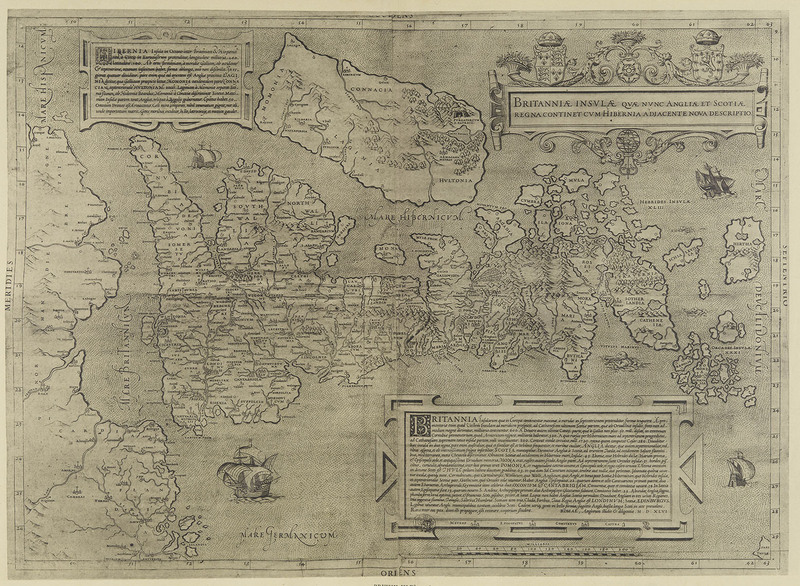 Despite this attempt to claim unique first-hand knowledge for the information given in the map, both the outlines and many names on Forlani’s map derive from the world map of another Venetian cartographer. 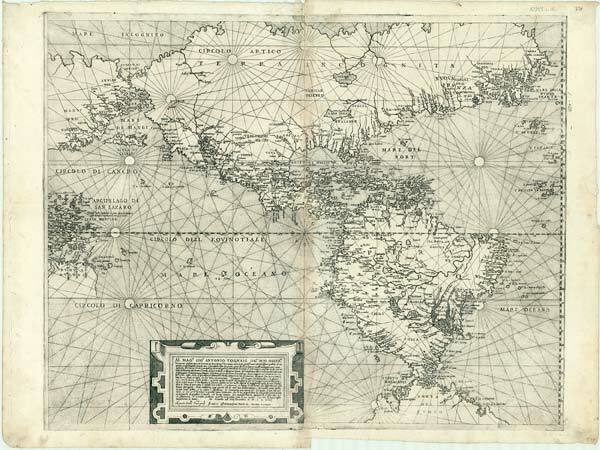 In 1561 Giacomo Gastaldi created a world map on multiple sheets, Cosmographia Universalis. This is an important source for Forlani’s maps of the Americas, although Forlani’s map leaves out the mountains, animals and sea monsters of Gastaldi’s version. One example of the similarities between these maps is the “Streto di Annian” shown dividing North America from Asia on Forlani’s map of the Americas. 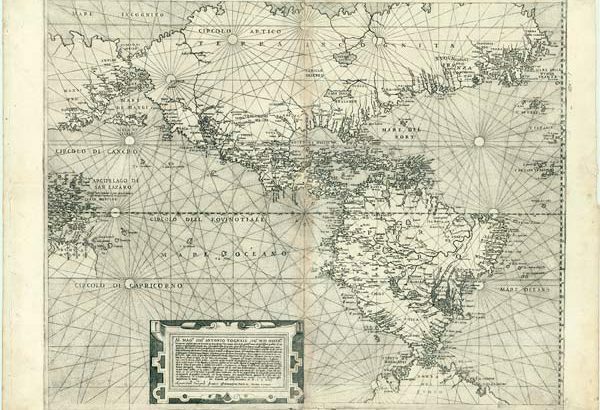 Gastaldi’s world map of 1546 Universale had shown North America joined to Asia. Paolo Forlani engraved several world maps based on Universale, including Universale Descrittione Di Tutta la Terra Conosciuta Fin Qui in 1562, which show an Amer-Asian continent. 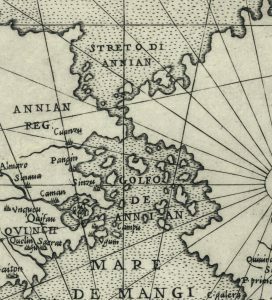 In contrast, Gastaldi’s 1561 world map Cosmographia Universalis clearly shows a channel separating the continents, and names this the “Streto di Anian”. A name repeated by Forlani. By Permission of the British Library. 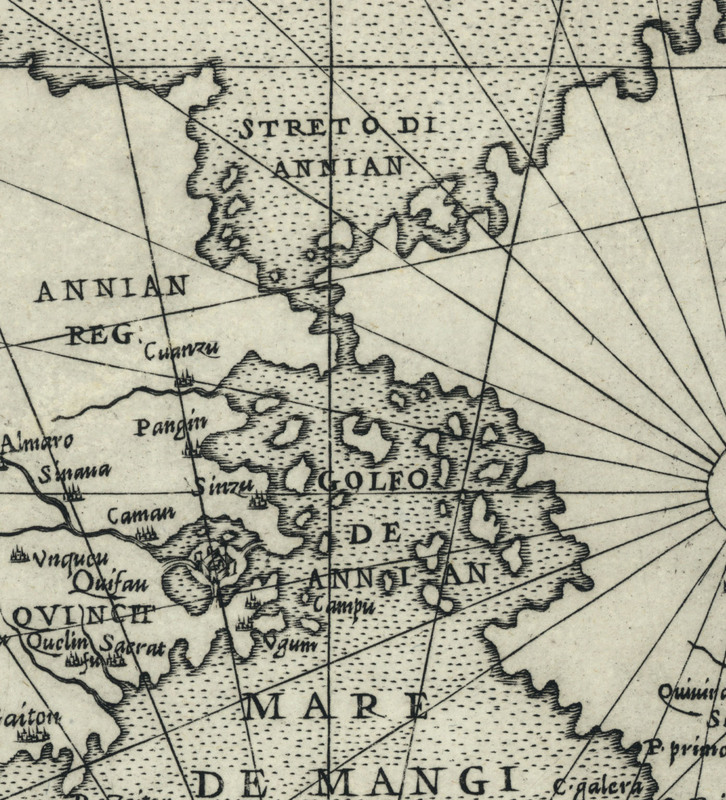 Extract from Gastaldi’s Cosmographia Universalis… 1561. This suggests that better information about the geography of the Pacific North-West had reached Italy by the early 1560s. The “Strait of Anian” would appear on maps for another century (although not always in the same location) until the expedition of Vitus Bering in 1728 formally mapped the Bering Strait. Another example of Paolo Forlani engraving new map plates based on existing maps is Scotia. 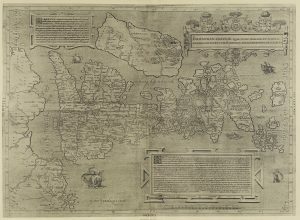 Regno di Scotia, the first printed map of Scotland, which was published between 1558 and 1566. This map is on display in You Are Here. Paolo Forlani’s Scotia. Regno di Scotia. Scotia. 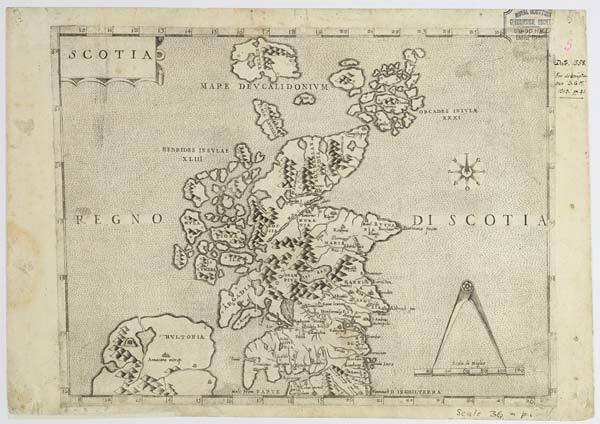 Regno di Scotia is based on George Lily’s 1546 map of the British Isles – Britanniae Insulae. 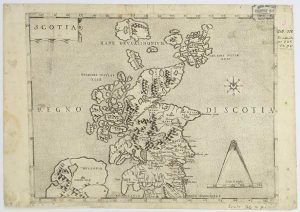 Forlani re-engraved the information for Scotland on a new plate to create the first printed map dedicated solely to the Kingdom of Scotland. Look out for our October map of the month – James Middleton’s A celestial atlas, containing maps of all the constellations visible in Great Britain, : with corresponding blank maps of the stars, systematically arranged for communicating a practical knowledge of the heavens published 1842.